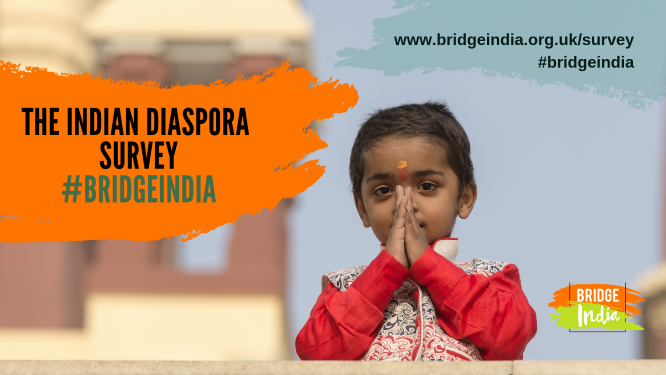 We are delighted to present our inaugural Bridge India Annual Diaspora survey. LONDON, 20 FEBRUARY 2019: Indian diaspora think tank Bridge India today launched is inaugural, pan-European Indian Diaspora survey. Bridge India is a progressive non-profit think tank dedicated to discourse on public policy for the betterment of India, and was launched in late-2018 in London. By launching this survey, the organisation seeks to develop a better and more detailed understanding of the Indian diaspora in Europe, including their relationship with India; and create a go-to resource for policymakers in Europe and India to understand diaspora’s issues and concerns better. India represents an ancient civilisation, united by a shared history and sustained by a pluralist democracy. The idea of India is one that is inclusive and with a Constitution that provides for the vast diversity of its composite culture. India’s national identity has been built on unity in diversity, and it has long celebrated the commonality of major differences amongst its people. It offers many truths, each of which give shape and substance to the idea of India. But the ‘India Story’ abroad is often presented through a narrow lens, be it focusing only on just business, society or policy. Given its diversity, everything about India, and its polar opposite, is true in unison. Bridge India seeks to highlight and celebrate this nuance, to help India-watchers understand India better, and enable diaspora to reengage with their country of origin. This survey will not only provide an overview of the diaspora landscape across Europe, it will help inform Bridge India’s activities in the coming year. It focuses on questions about NRI voting rights, politics, how well integrated Indian diaspora are in their home country in Europe, motivations for emigrating, trade relations and more. The results will be released in London in Summer 2019. A number of community organisations from the UK, Germany and the Netherlands have already expressed interest in disseminating the survey across their networks to engage as widely as possible. “There are nearly 30m people of Indian origin around the world. Surveys such as these are important for understanding the views of the current generation, and can help policy-makers better interact with the diaspora,” said Dr A Didar Singh, Advisor to Bridge India, former Secretary to Government of India in the Ministry of Overseas Indian Affairs, and former Secretary-General of FICCI. “Since our launch just a few months ago, we have been overwhelmed with the response from diaspora from the UK and more widely, illustrating a real need for an organisation like Bridge India. This survey helps provide a common voice to celebrate the Indian diaspora across Europe, and find out where policy-makers could better serve them,” said Pratik Dattani, Advisor to Bridge India. “Indian diaspora contribute substantially to the cultural, social and economic fabric of Europe’s economies. We at NISAU have led on many initiatives to promote a bridge between Indian and our members’ countries of residence in Europe. We welcome this important survey from Bridge India to help continue that dialogue,” said Sanam Arora, Founder and Chairperson of the National Indian Students & Alumni Association UK. The survey link is at https://www.bridgeindia.org.uk/survey/ and it takes no more than 10min to complete. They survey is open until 31st March. To develop a better and more detailed understanding of the Indian diaspora in Europe, including their relationship with India and the country in which they live. Create a go-to resource for policymakers in Europe and India to understand diaspora’s issues and concerns better. Provide diaspora across Europe a unified voice. The survey takes less than 10min to complete. Click here to complete the survey. This survey will also help us shape the activities and priorities of Bridge India over the coming year, including additional research. If you would like to enquire about sponsorship and branding opportunities available with the report, please email us at contact@bridgeindia.org.uk. Cauvery water dispute: Economic, Social or Political? Who are the “boat people”? Where did they come from?